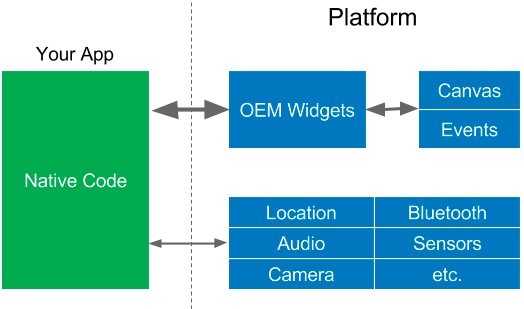 Your app talks to the platform to create widgets, or access services like the camera. The widgets are rendered to a screen canvas, and events are passed back to the widgets. This is a simple architecture, bu t you pretty much have to create separate apps for each platform because the widgets are different, not to mention the native languages. Here lies one of the main keys to understanding React Native performance. Each realm by itself is blazingly fast. The performance bottleneck often occurs when we move from one realm to the other. In order to architect performance React Native apps, we must keep passes over the bridge to a minimum. Flutter has a new architecture that includes widgets that look and feel good, are fast, and are customizable and extensible. That’s right, Flutter does not use the OEM widgets (or DOM WebViews), it provides its own widgets. Flutter moves the widgets and the renderer from the platform into the app, which allows them to be customizable and extensible. All that Flutter requires of the platform is a canvas in which to render the widgets so they can appear on the device screen, and access to events (touches, timers, etc.) and services (location, camera, etc. ).